The award-winning physicist has been instrumental in developing ultra short pulse lasers and streak cameras. 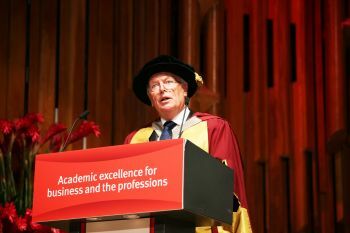 Eminent physicist, Emeritus Professor Wilson Sibbett, has received an honorary degree from City, University of London. He was awarded an Honorary Doctor of Science in recognition of his outstanding contribution to scientific research and development during one of City's summer graduation ceremonies on 18th July 2017. Prior to taking up the Wardlaw Chair of Natural Philosophy at the University of St Andrews in 1985, Professor Sibbett held the posts of Lecturer and Reader in Physics at Imperial College London. Following his undergraduate degree in physics at Queen’s University Belfast (QUB) he undertook research studies in laser physics at QUB and Imperial College London, leading to the award of a PhD in 1974. His primary areas of research relate to the development, assessment and application of lasers that produce very short pulses of light with applications ranging from ultrafast photographic techniques to fundamental time-resolved studies in biology and medicine. Professor Sibbett advised graduands from the School of Mathematics, Computer Science & Engineering to ‘stay connected’ and observe a healthy work-life balance. He reminded them of the 'enormous connectivity connectivity in our digital age' and the need to 'glean and discern the most appropriate advice'. His research awards include the Boys Medal & Prize of the Institute of Physics, the Rank Prize for Optoelectronics, the Rumford Medal of the Royal Society, the Quantum Electronics Prize of the European Physical Society, the Royal Medal of the Royal Society of Edinburgh and the Charles Hard Townes Award of the Optical Society of America. He is a Fellow of the Royal Society, the Royal Society of Edinburgh, the Optical Society of America, the European Optical Society and has been awarded honorary degrees by Trinity College Dublin and by Dundee, Glasgow and Strathclyde Universities and has recently received Honorary Fellowship status from the Institute of Physics. Between 2002 and 2006 he was the Chief Scientific Adviser to the Scottish Government. A keen golfing fan, Professor Sibbett served as Chairman of The R&A from 2012 to 2015. Time-resolved spectroscopy is the study of dynamic processes in materials or chemical compounds by means of spectroscopic techniques.